﻿ Matthew 3:15 But Jesus answering said to him, "Permit it at this time; for in this way it is fitting for us to fulfill all righteousness." Then he permitted Him. Jesus answered him, "Allow it for now, because this is the way for us to fulfill all righteousness." Then he allowed Him [to be baptized]. But Jesus answered him, "Let it be this way for now, because this is the proper way for us to fulfill all righteousness." 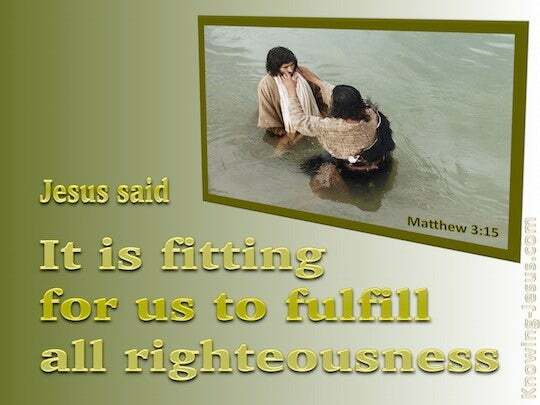 But having answered, Jesus said to him, Allow it now, for thus it is fitting for us to fulfill all righteousness. Then he allows him. But Jesus answering said unto him, Suffer it now: for thus it becometh us to fulfil all righteousness. Then he suffereth him. But Jesus replied to him, Permit it just now; for this is the fitting way for [both of] us to fulfill all righteousness [that is, to perform completely whatever is right]. Then he permitted Him. But Jesus answered him, "Allow it [to be done], for it is proper for us to complete everything that is right [before God]." So, John agreed to it. But Jesus answering said to him: Permit it now; for thus it be comes us to perform fully every righteous act. Then he permitted him. But Jesus made answer, saying to him, Let it be so now: because so it is right for us to make righteousness complete. Then he gave him baptism. But Jesus answered him, "Let it be so now; for thus it is fitting for us to fulfill all righteousness." Then he consented. and Jesus answer'd, Let it be so for the present, for it becometh us to do whatever is right. then John consented. But Jesus answering said to him, Suffer it now; for thus it becometh us to fulfil all righteousness. Then he suffers him. And Jesus responding said to him; Suffer it now; for thus it is becoming us to fulfil all righteousness. Then he suffers Him. But Jesus answered, "Let it be so this time, for it is right for us to do everything that God requires." Then John consented. And Jesus answering said to him, Suffer it now; for thus it becometh us to fulfil all righteousness. Then he suffered him. And Jesus answering said unto him, Suffer it to be so now, for thus it is expedient for us to fulfil all righteousness. Then he suffered him. And Jesus having answered said to him, Permit now; for so it is suitable for us to complete all justice: then he permitted him. 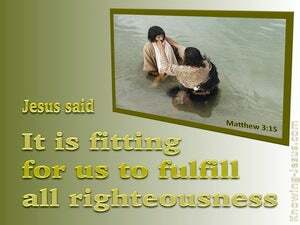 And Jesus answering said unto him, Permit it to be so now: for thus it is fitting for us to fulfill all righteousness. Then he permitted him. 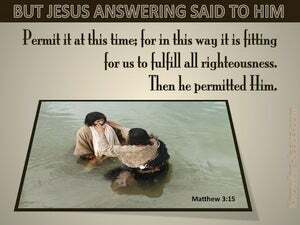 But Jesus answered [and] said to him, "Permit [it] now, for in this way it is right for us to fulfill all righteousness." Then he permitted him. And answering Jesus said to him, Allow it now, for it is becoming to us to fulfill all righteousness. Then he allowed Him. Jesus answered and said to him, "Let it be so now, for thus it becometh us to fulfill all righteousness." Then he suffered him. But Jesus answered him, "Come now, this is how we should fulfil all our duty to God." Then John gave in to him. But Jesus answered, "Permit it now, for so it is fitting for us to fulfill every religious duty." So Jesus replied to him, "Let it happen now, for it is right for us to fulfill all righteousness." Then John yielded to him. And Jesus answering said to him, Suffer it now; for thus it becometh us to fulfill all righteousness. Then he suffered him. But Jesus answering, said unto him, Suffer me even now, - for, thus, it becometh us, to fulfil, all righteousness; then, he suffered him. But Jesus answering said unto him, Permit it to be so now, for thus it becometh us to fulfil all righteousness. Then he permitted him. "Let it be so for the present," Jesus answered, "since it is fitting for us thus to satisfy every claim of religion." Upon this, John consented. And Jesus answering said to him, Suffer it to be so now: for thus it becometh us to fulfill all righteousness. Then he suffered him. But Jesus answered him, "Let it be so now, for this is the fitting way for both of us to do our full duty to God." Then he yielded to Him. But Jesus, answering, said to him, "Suffer it now; for thus it becomes us to fulfill all righteousness." Then He suffers Him. And Jesus answering said unto him, Permit it now; for thus it becometh us to fulfil all righteousness. But Jesus answering said to him, 'Suffer now, for thus it is becoming to us to fulfil all righteousness,' then he doth suffer him.